Endothelium is a type of epithelium that lines the interior surface of blood vessels and lymphatic vessels, forming an interface between circulating blood or lymph in the lumen and the rest of the vessel wall. 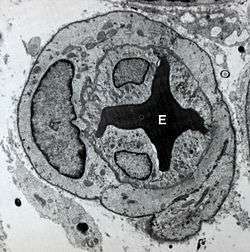 It is a thin layer of simple squamous cells called endothelial cells. Endothelial cells in direct contact with blood are called vascular endothelial cells, whereas those in direct contact with lymph are known as lymphatic endothelial cells. ↑ Eskin, S.G.; Ives, C.L. ; McIntire, L.V. ; Navarro, L.T. "Response of cultured endothelial cells to steady flow". Microvascular Research. 28 (1): 87–94. doi:10.1016/0026-2862(84)90031-1. ↑ Langille, B L; Adamson, S L (1981). "Relationship between blood flow direction and endothelial cell orientation at arterial branch sites in rabbits and mice". Circulation Research. 48: 481–488. doi:10.1161/01.res.481. ↑ "FMA". Archived from the original on 2013-10-02. Retrieved 2013-09-28. ↑ Kovacic, Jason; Mercader, Nadia; Torres, Miguel; Boehm, Manfred; Fuster, Valentin (2012). "Cardiovascular Development to Disease Epithelial-to-Mesenchymal and Endothelial-to-Mesenchymal Transition: From Cardiovascular Development to Disease". Circulation. 125: 1795–1808. doi:10.1161/circulationaha.111.040352. Retrieved 8 November 2014. ↑ Li X, Fang P, et al. (April 2016). "Mitochondrial Reactive Oxygen Species Mediate Lysophosphatidylcholine-Induced Endothelial Cell Activation". Arteriosclerosis, Thrombosis, and Vascular Biology. doi:10.1161/ATVBAHA.115.306964. PMID 27127201. ↑ Deanfield J, Donald A, Ferri C, Giannattasio C, Halcox J, Halligan S, Lerman A, Mancia G, Oliver JJ, Pessina AC, Rizzoni D, Rossi GP, Salvetti A, Schiffrin EL, Taddei S, Webb DJ (January 2005). "Endothelial function and dysfunction. Part I: Methodological issues for assessment in the different vascular beds: a statement by the Working Group on Endothelin and Endothelial Factors of the European Society of Hypertension". J Hypertens. 23 (1): 7–17. doi:10.1097/00004872-200501000-00004. PMID 15643116. ↑ Roberts OL, Holmes K, Müller J, Cross DA, Cross MJ (Dec 2009). "ERK5 and the regulation of endothelial cell function". Biochem Soc Trans. 37 (6): 1254–9. doi:10.1042/BST0371254. PMID 19909257.